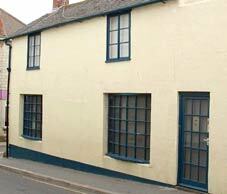 The cottage is in the centre of town two minutes walk from the seafront. Church Street is a continuation of the main shopping street (Broad Street) where there are numerous gift shops, boutiques, art and craft galleries, pubs, cafes and restaurants. 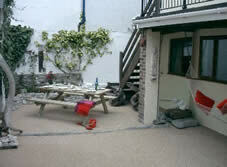 The cottage is ideally suited for exploring Lyme Regis on foot. As for Lyme itself, it is a lively little town very proud of its rich historical heritage. It has a truly 'Old England' feel about it - very unspoilt - with many of the local families having lived and worked there for centuries. abduction of a local heiress made famous in 'Tom Jones', Jane Austen wrote 'Persuasion' based in Lyme, Beatrix Potter's ' Little Pig Robinson' based on views of the town. Turner painted here as did Whistler - 'The little Rose of Lyme Regis'. In more recent times John Fowles wrote the novel 'The French Lieutenants Woman' which was then made into a film with many of the local people acting as cast. The other thing Lyme is famous for is its fossils - it has recently been made a World Heritage site. Mary Anning was born here in 1799 and is buried in the churchyard. She was famous for being the first person to excavate an Ichthyosaur. Fossils can easily be found along the beaches surrounding Lyme Regis.We have a fossil workshop in Charmouth (the next village along) and my partner Chris Moore is a well known locally (his new species of Ichthyosaur is in the Natural History Museum in London). What more can I tell you about Lyme? There's sailing, surfing, diving, boat trips and fishing not to mention golf, bowling and horse riding. Of course there is a museum, theatre, cinema, town mill and even a micro brewery to explore too. Its location on the border of Devon and Dorset make it an ideal base for trips further afield (Dorchester, Exeter, Glastonbury to name a few). The owner, Tracey Barclay, lives in Charmouth about 2 miles away so she will be on hand if you need any advice while you are staying.